and Greater focus on customer experience. 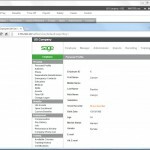 The new Sage HRMS 2016 welcome screen orients you with a home base from which to navigate to connected services such as Sage ESS and My Workforce Analyzer (available for additional fees) from one place. You can also customize the welcome screen by adding links to your favorite online resources and use employee search to quickly find records by typing an employee’s name or ID. When employees aren’t available to perform certain tasks, you can act as backup. 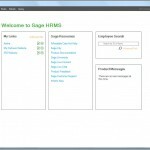 Sage HRMS 2016 allows HR administrators to log on to Sage ESS as specific employees, performing tasks on their behalf or helping them navigate the system. The Affordable Care Act brings new responsibilities to the benefits administrator’s role. My Workforce Analyzer makes those tasks easier by pulling healthcare enrollment information from Sage HRMS 2016 to complete the 1094-C and 1095-C for submission to the IRS as well as distribution to employees. Contact CMS today to set up a preview of Sage HRMS 2016, or ask a question. This entry was posted in news and tagged aca, employee self service, my workforce analyzer, Sage Abra, sage hrms 2016. Bookmark the permalink.